Event fatigue is real, and when publishers are constantly pushing crossovers that extend to a wide variety of other titles, the specialness of these events is lost. They begin to feel like cash grabs rather than stories that genuinely deserve this expanded scope. The past year and a half of DC Rebirth has had smaller crossovers in Batman, Superman, and Justice League books, but the publisher has been wise to avoid a line-wide crossover until after its relaunched titles had time to stand on their own. 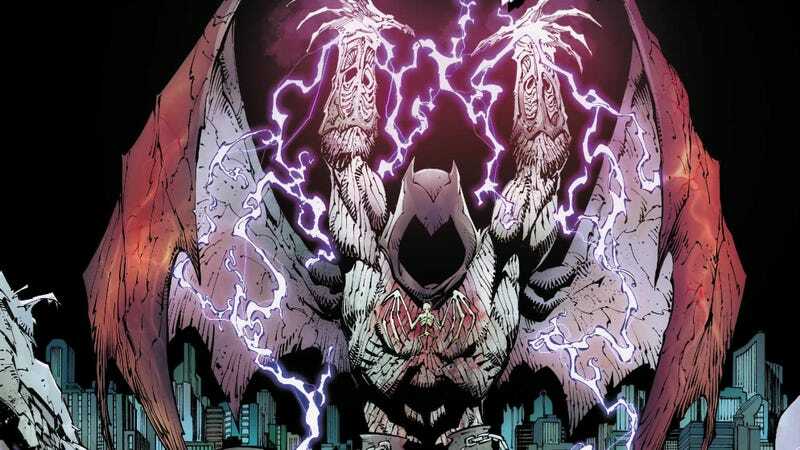 Dark Nights: Metal is the first major event of the Rebirth era, and it actually is a big deal, reuniting the New 52 Batman creative team of writer Scott Snyder, artist Greg Capullo, inker Jonathan Glapion, and colorist FCO Plascencia. Batman was the biggest hit of the New 52, but the Rebirth landscape is very different, representing a return to optimism and hope for DC heroes. Dark Nights: Metal is fixated on darkness, but it goes way over-the-top with its story, embracing the superhero genre’s ability to makes ludicrous plot points acceptable if the creative team commits to a spectacular tone and establishes a clear emotional throughline. Dark Nights: Metal is about magic metals that open a portal to a Dark Multiverse where evil versions of Batman reign supreme, and it’s a gleefully sensational superhero tale that gives this team license to exaggerate. The exhilaration of metal music is a major influence of this story, and Snyder has crafted a story that turns the volume all the way up and allows the art team to deliver increasingly dramatic visuals with each new issue. This exclusive preview of Dark Nights: Metal #3 begins with a light scene that shows the creative team’s sense of humor, even if this warm moment is just another part of Superman’s ongoing torture by the evil Barbatos. That moment of a giant finger stabbing through a bloody bat-symbol on Bruce Wayne’s chest and the shot of Barbatos at the end of the page represent a shift into heavy metal imagery, and the rest of the preview is filled with spikes, flames, skeletons, Doomsday-infected humans, and dragons with Joker faces. This team has always been best when it embraced the thrill of superhero fantasy, and Dark Nights: Metal is a prime example of how to tell a fun story with characters who are unabashedly evil. The subject matter is dark, but the heart of this event is bright.